St. Moses was born about 332 A.D. In his youth, he was the slave of a high government official who could not tolerate his dishonesty and violence. It was even said that St. Moses went so far as to commit murder. Finally, his master drove him out of his house. 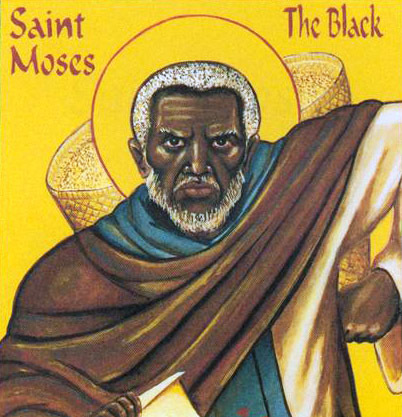 Subsequently, St. Moses became the head of a gang of seventy robbers, as he was known for being a strong and fierce man of huge stature. Once, as he was walking along the banks of the Nile, he spotted some sheep and a shepherd on the opposite side of the Nile. The Nile at that time was at full flood and more than a mile wide. St. Moses put his sword between his teeth and swam across the river. When the shepherd saw him, he ran away and buried himself in the sand. The sheep were left for St. Moses, who chose four of the best rams, slew them, and tied them with a rope. He then carried them on his back and swam back across the river. He came to a small village where he skinned the rams, ate the best portions of them, and sold the rest for wine. The specific circumstances regarding the conversion of St. Moses are not known. However, it was mentioned that St. Moses addressed the sun saying, “If you are God let me know, and You the God whom I know not, lead me to You.” St. Moses heard from someone that the monks in the wilderness of Scetis knew God, so he immediately girded himself with his sword and went to the wilderness. When St. Moses was seen next, he was in Scetis in the western desert of Egypt. An elder found him and led him to St. Macarius the great at Petra in the northern end of Scetis. It was about 365 A.D. when St. Moses arrived there. At that time, thousands of monks had followed St. Macarius after he came to that area in the year 340 A.D.
For St. Moses, the white robe he received after baptism, and the monastic lifestyle did not mean that he entered into the paradise of contemplation. On the contrary, he had in front of him many years of strife and fierce struggle with the flesh, the devil and the world. Although he was surrounded by giants of the spiritual life whose counsel he could seek at any time, and was aided by the church mysteries and means of grace, it was with utmost difficulty that he won the long successive and violent battles of the flesh. After he came to the desert, St. Moses still enjoyed his former bodily strength, but his old evil passions were as powerful as before. Once, after St. Moses fasted seven days, he overpowered four thieves who entered his cell. He tied them all together with cords and lifted them up on his shoulders like a bag of straw. He brought them to the church and said to the monks, “Since I have not the power to do evil to any man, what do you want me to do with these who rose up against me to slay me?” When the thieves knew that St. Moses was a former robber, who had repented, they were quickly led to repentance. Still, St. Moses disputed with his spiritual father and insisted on continuing to wage war with the devils until they departed from him. The wise and experience St. Isidore gave him this conclusive answer: “In the name of Jesus Christ, from this point forward the devils shall cease from you. Draw near then and participate in the Holy Mysteries, and you shall be free from all impurity, both of the flesh and of the spirit.” With this, St. Moses returned to his cell. St. Isidore came to him after two months and asked about his condition. St. Moses reported he no longer suffered from anything; moreover, he even had power over the demons. St. Moses became very famous among the monks of Scetis because of his humility, his meekness and his love for strangers. His solitude was frequently interrupted by the influx of visitors. He went to St. Macarius and said, Father, I desire to live in silence, but the brethren never leave me. St. Macarius advised him to move to an isolated cell in Petra. Petra (literally meaning rock) is the northern area of Scetis. It was a distant area, difficult to reach, with scarce water. St. Moses lived in Petra for six years in a cave that he dug for himself in the rock. He became known as Abba Moses of Petra. Once the Fathers of the Scetis were holding a council to reprimand a monk who had committed a fault. St. Moses was invited, but he refused to attend. The priest went to him, and said, “Come, for the people are expecting you.” St. Moses arose, took a basket filled with sand that had a hole in the bottom of it, carried it on his shoulder and started walking towards the council. When the monks saw him coming with the bag of sand, with sand pouring out of the hole, they asked him the reason of his behavior. He said to them, “The sand you see running from the bag represents my sins which are always following me, and yet, today I am coming to judge the errors of my brother.” When they heard this, they left the council and every monk went to his own cell, as none could judge that monk. The prophecy of St. Macarius was fulfilled in 407 A.D., when the Berbers raided Scetis and destroyed its four churches. St. Moses was seventy-five years old and had under him seventy disciples. On the day of this raid, St. Moses was sitting with seven of his disciples, when he told them, “Behold, today the barbarians are coming to Scetis, rise and escape.” They asked him, “Will you not escape with us father?” He answered, “The words of our Savior must be fulfilled: All who take by the sword will perish by the sword.” Matthew 26:52 “Therefore, I am staying.” The seven disciples also decided to stay with their father. Shortly thereafter, the Berbers entered the cell and killed them. One of the monks was able to flee and hid behind a palm leaf, from where he saw seven crowns coming down and crowning them. The monks of El Baramos monastery at Scetis have faithfully kept the body of St. Moses, which remains to this day beside the body of his spiritual father, St. Isidore, inside the main church of the monastery.